A powerhouse of a compound bow (at a price point almost too good to pass up), the Quest Radical is not only impressive because of it’s amazing accuracy and adjustability, but also because of the unique engineering and design behind it. While you’ll have a bunch of different compound bow options available to pick and choose from, there’s a good reason (or two) behind why so many folks are snapping up these Quest Radical left and right. Really fun to shoot, super smooth and silent, and effortless to adjust, the Quest Radical helps new archers and more experienced pros get the results they’re looking for. Let’s dig a little deeper into everything that this bow has to offer! This bow is manufactured using only the highest quality aluminum components, giving you the best possible weight to strength and power ratio out there. It certainly doesn’t hurt that this bow is a lot stronger and more durable than some of the carbon fiber options out there (great news for those that intend to take this bow out into the woods!). The lightweight properties of this power cannot be understated, especially since they (and the fact that the draw weight can be almost infinitely adjusted) make this such an attractive bow for newbies and more experienced archers alike. We’ve already touched on how the forged aluminum body of this Quest Radical bow makes it powerful and light, but the super smooth and near silent cams guarantee that you’re able to use this bow out in the woods – even while hunting turkeys – effectively. Tuning the bow, the cams, and the draw weight/length is really easy – with or without tools on hand. This makes the bow effortless to adjust on the fly, giving you the ability to maximize the potential of your archery skills and really tailor your bow to your body and talent. There are some plastic components that you’re going to find on this bow, and it really lowers the overall “premium” feel and design that the Quest Radical has at first. The plastic guard on the bow cable is slick and slippery right out of the box, and may make things a little bit tougher to get used to until you break the Quest Radical in. Another beef that some people have with the Quest Radical is the fact that the axles can be a little bit short compared to other options in the compound bow world. Tuning the bow for precision and accuracy can be finicky because of this, and it makes this bow at lot less forgiving. A quick search online for reviews of the Quest Radical turns up plenty of people that are overjoyed with their purchase of this compound bow. The bulk of the reviews you’re going to come across are very positive, with folks really complimenting the lightweight materials that combine with top tier performance and accuracy. 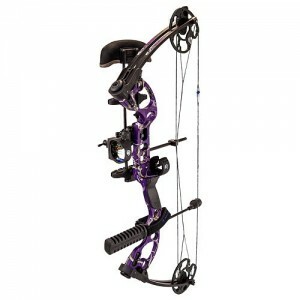 Trying to find a new bow these days can be a real nightmare, especially since there are so many different choices to pick and choose from. Thankfully though the process gets to be a lot more streamlined when you decide to move forward with a reliable, exciting, and effective option like the Quest Radical. Offering everything you’re looking for the best compound bow these days (without breaking your bank account along the way), you’ll be impressed with the flexibility of this bow as well as it’s consistent accuracy.